Our quest to simplify IoT extends to customers who want to take advantage of IoT without knowing anything about the cloud. I am delighted to announce Azure IoT Central is now generally available (GA). With IoT Central, we harness the key complexities of operating, managing, securing, and scaling an IoT solution so customers can bring their connected product vision to life faster, without requiring cloud solution expertise. Connect devices, set monitoring rules over your devices, and get results fast by leveraging a fully-managed solution with built-in analytics for quick insights. Customers can run production workloads of all sizes with IoT Central using a host of new capabilities backed with high availability SLAs and built on proven enterprise-grade services. IoT Central customers can now quickly build solutions by reusing existing device templates. Onboard and connect devices securely at scale with zero-touch provisioning. With the new bulk device management capabilities, managing devices at scales and completing frequent jobs such as rebooting, resetting, or updating devices just became much simpler and quicker to complete. Check out the demo video of these new capabilities on IoT Show. In addition to harnessing the complexities of cloud development in our product, we are also improving connectivity to the cloud itself. As an example, we have collaborated with MultiTech, a leading provider of communications hardware for the Internet of Things, to integrate IoT Central functionality into the MultiConnect® ConduitTM programmable gateway. This new partnership enables seamless connection capability from Modbus connected equipment, directly into IoT Central for unparalled simplicity from proof of concept through wide-scale deployments. In addition to the recently announced set of extensibility features, customers can now use Azure Functions to trigger serverless workflows that execute business logic without the need for setting up custom applications or infrastructure. The IoT Central connector for Microsoft Flow opens up hundreds of published connectors for no-code integrations to enable powerful scenarios like Connected Field Service (CFS) to help reduce costly scheduled maintenance by proactively detecting and resolving issues. Webhooks enable users to connect an IoT Central app to other applications and services for remote monitoring and notifications. They automatically notify your other applications when a certain rule is triggered in the IoT Central app. With the new IoT Central connector and the webhooks action, customers can connect IoT Central to the rest of their business for the final step of their digital transformation journey. Users can now perform bulk device management actions through with the Jobs feature, allowing them to administer their devices at scale. These updates work on a device’s properties, settings, and commands. Bulk device management is simple. After navigating to the new Jobs tab, click the “+new” button to create a job. Then, fill out basic information like the name of the job, a description, the device template, and job type. From there, select the specific devices to apply the job to, and then run. Using the IoT Central connector in Microsoft Flow, users can trigger workflows when a rule is fired in IoT Central. They can then use the actions in that connector to create a device, update a device’s properties, or delete a device. 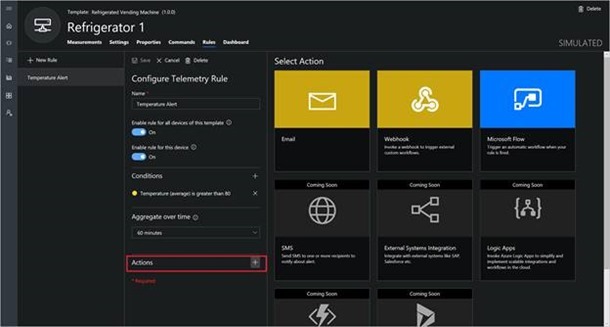 This new capability is found by creating a rule and selecting Microsoft Flow Action. From there, the user is taken to the robust Microsoft Flow designer where they can set up any number of preconfigured connectors, including notifications to Microsoft Teams, an update in Dynamics, or even posting to Twitter. Currently, the Flow connector works for 30 day trials and all paid apps. After selecting Microsoft Flow as an action, the user will be taken to the Flow web app where they can configure and add any action supported by Microsoft Flow to their IoT Central application. For a full breakdown of the process, check out the Flow documentation page. Webhooks enable users to connect an IoT Central app to other applications and services for remote monitoring and notifications. They automatically notify your other applications when a certain rule is triggered in the IoT Central app. The IoT Central app will send a POST request to the other application’s HTTP endpoint if a rule is triggered, and the payload will contain device details as well as the rule trigger details. 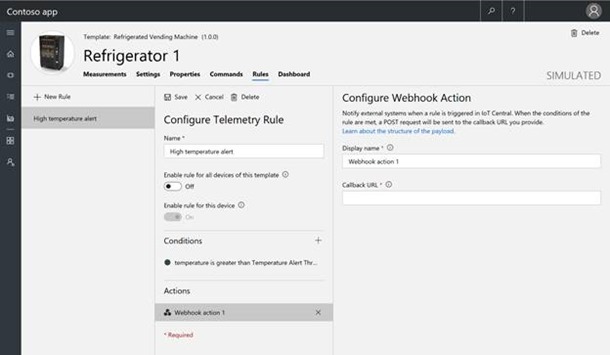 Users can set up the webhook action within the “new rule” screen by selecting “web hook” as an action. For more details and a full tutorial on using Webhooks, visit the Webhook actions page. In order to empower IoT Central apps to do more, users can now add up to five actions to a single rule, streamlining the process of notifying both users and other services in the user ecosystem. To explore the full set of features and capabilities start your free trial and learn more on the IoT Central website. Check out our documentation including tutorials to connect your first device. Have feedback or questions? Don’t hesitate to write to us at iotcfeedback@microsoft.com. To learn more about the Azure IoT portfolio, including latest news, visit the Microsoft Azure IoT page.